Welcome to Naber Produce Farm! We are a family farm located near York, NE on some of the most productive soils in the state. It is here where we grow some of the finest fruits and vegetables around. We started growing produce in 1992 for retail sale before moving to our current location near York, NE. We've been in business at this location since 1997 on land previously owned by our grandparents. Here we grow high quality fruits and vegetables for our own roadside stands and farmers' markets. We also provide wholesale produce to grocery stores, schools, and restaurants. 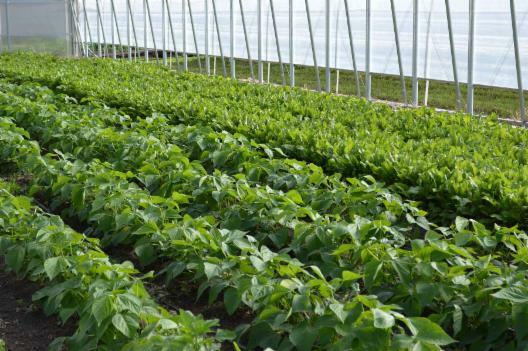 A majority of our produce is grown in unheated tunnels which protect the plants from the elements. We currently have six tunnels like the one pictured above. We also have one heated greenhouse that allows us to give you high quality tomatoes early in the year. We do not grow any of our produce hydroponically, all of our plants are grown in the soil so they have the flavor you know and love. We are widely known for our sweet corn, and if you are in York you'd better be buying it from Naber Produce! We also grow tomatoes, cucumbers, zucchini, peppers, broccoli, and many other fruits and vegetables. Everything we grow and sell is put into refrigeration, appropriate for each crop, as soon as possible after harvest, which assures you of receiving the highest quality vegetables or fruits possible. Quality control begins with seed selection and continues right up to the point of sale, because we love our repeat customers! So look us up and maybe bring a friend, we look forward to serving you. We strive to give you the best produce for your table.